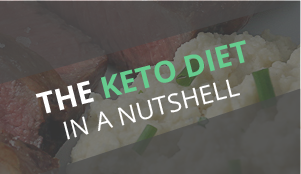 So I’m super excited that I was able to publish Ketofied! 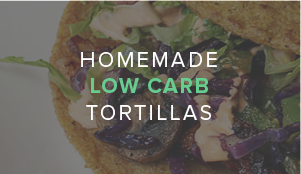 Comfort Foods Made Low Carb, the second cookbook from me and the website 🙂 Check it out and see all the new recipes you’ll be able to make! 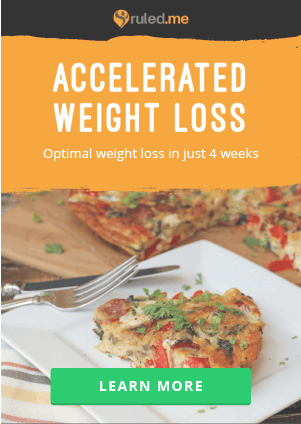 If the book isn’t in your budget at the moment, DON’T WORRY – I am hosting a giveaway for (the only) print copy of the book I have. 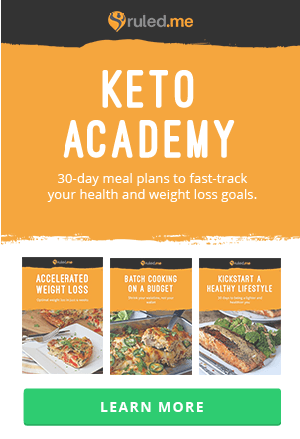 This also includes almond flour, erythritol, liquid stevia, and a chocoperfection sampler pack. I think you guys will love the prize! Check out the giveaway here, but be quick because it ends tonight! So, now to the pots de crème. 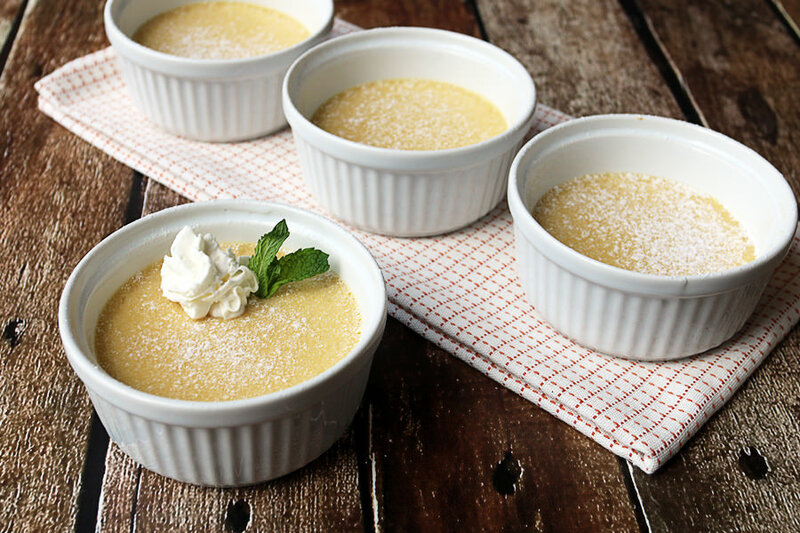 I’ve never tried pot de crème before, but from what I read before I started, they’re supposed to be very rich and filling. These are exactly that – extremely rich and decadent, very filling and could even be eaten by themselves, and definitely delicious! 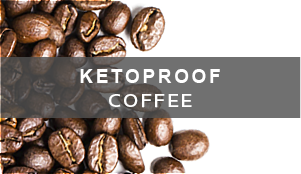 I know I was talking about a new take on fat bombs the other day, and these certainly qualify themselves, too! I’d recommend making these for a special occasion, if people come over for dinner for example, as they’re an easy way to impress people with the deep flavors you’ll be able to impart in them. 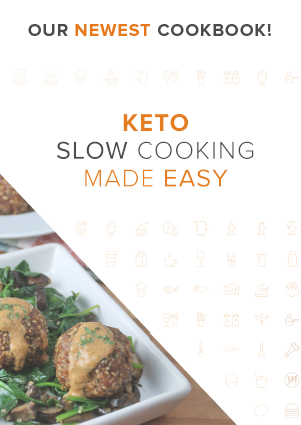 You can also change the recipe up really easily. If you don’t want to do a caramel flavored pot de crème, you could easily sub out the extracts to make pretty much any flavor you’d like! Check out this extract sampler pack to give you ideas! 1. Preheat your oven to 300F. Start by separating the yolks of 4 eggs and setting them aside. You can save the whites to add to different cake recipes around the site. 2. Using a spice grinder (you can pick this one up cheap), powder 1/4 cup NOW erythritol. Be careful when you take the lid off because powder will float into the air. 3. Mix the powdered erythritol with 6 tbsp. water in a small saucepan. 4. 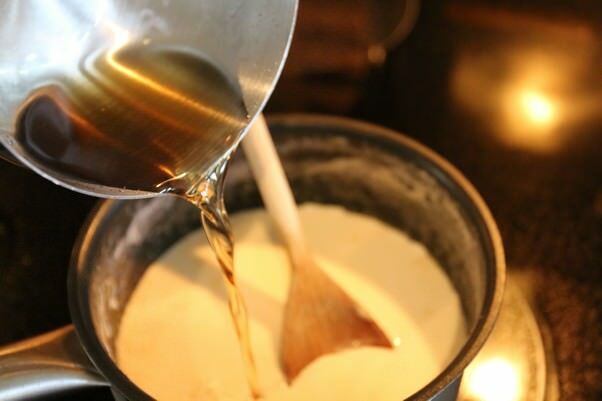 Mix together 1 1/2 cups heavy cream, 1/4 tsp. liquid stevia, 1/4 tsp. salt, 1/2 tsp. vanilla extract, and 1 tsp. maple extract in a bigger saucepan. 5. Bright both of the mixtures to a rolling boil. 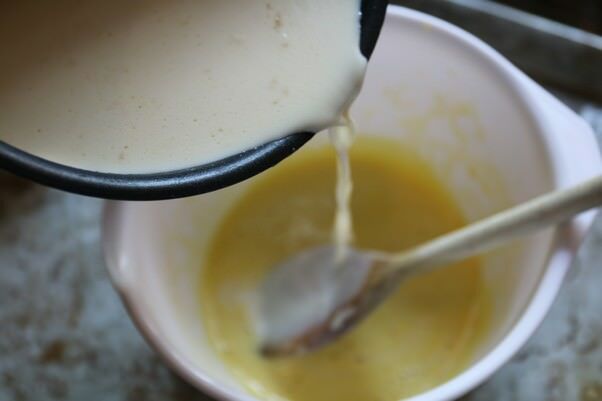 Once the cream reaches a boil, stir vigorously and turn heat down to low. Occasionally stir this as you work with the other mixture. 6. Once the water and erythritol has been boiling for a minute, add 1 tbsp. maple syrup. If you don’t want to make the whole maple syrup recipe for 1 tbsp., you’re welcome to sub in 1 tsp. Maple Extract + 1/4 tsp. Xanthan Gum if you’d like. 7. Whisk egg yolks well with a whisk until lighter in color. 8. 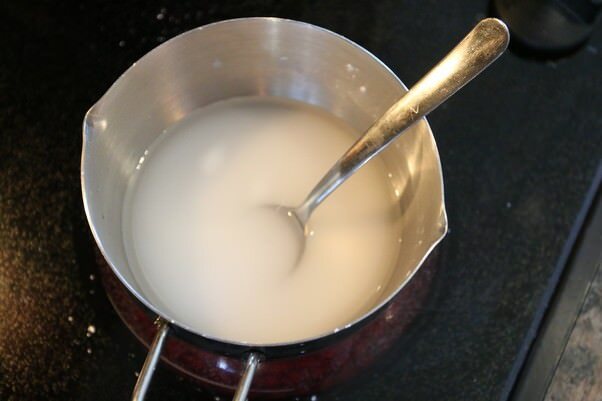 Continue boiling the water and erythritol mixture until it has reduced some and a watery syrup is formed. 9. 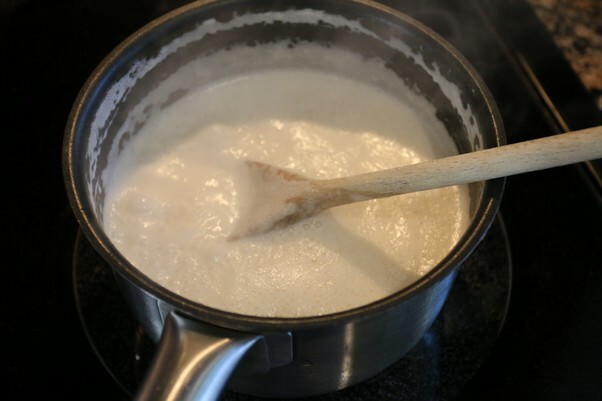 Pour the water and erythritol mixture into the heavy cream and stir to combine. 10. 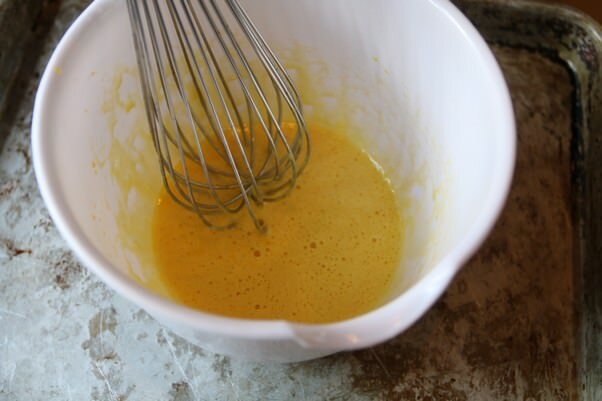 Slowly pour 1/4 of the cream mixture into the egg yolks while mixing. 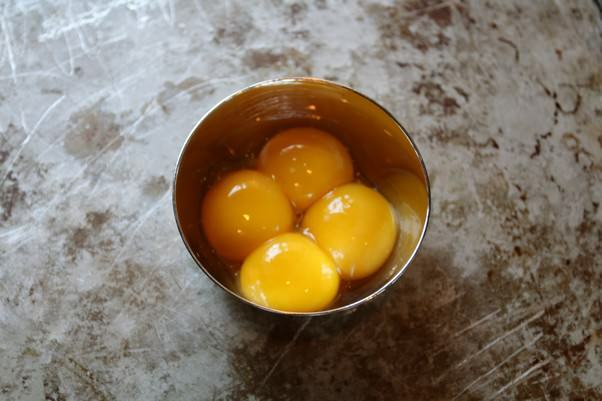 You want to temper the egg yolks so make sure you add slowly and not too much at once. 11. 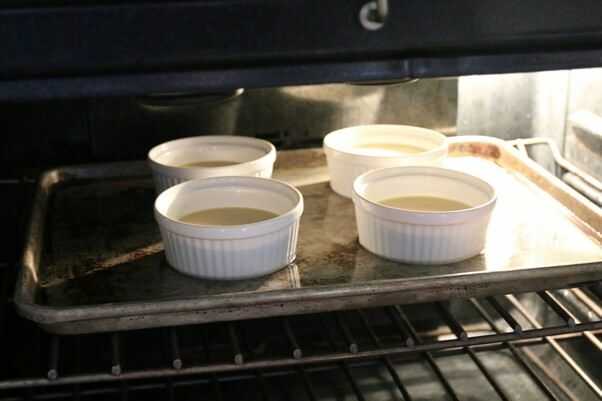 Measure out the mixture between 4 or 6 ramekins depending on the size of the ramekin. 12. Fill baking sheet 2/3 of the way with water. 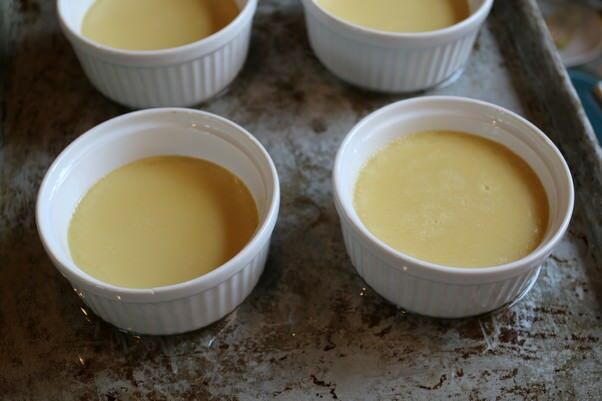 Put your ramekins in the water and bake at 300F for 40 minutes. 13. Take out of the oven and let cool for 10-15 minutes. 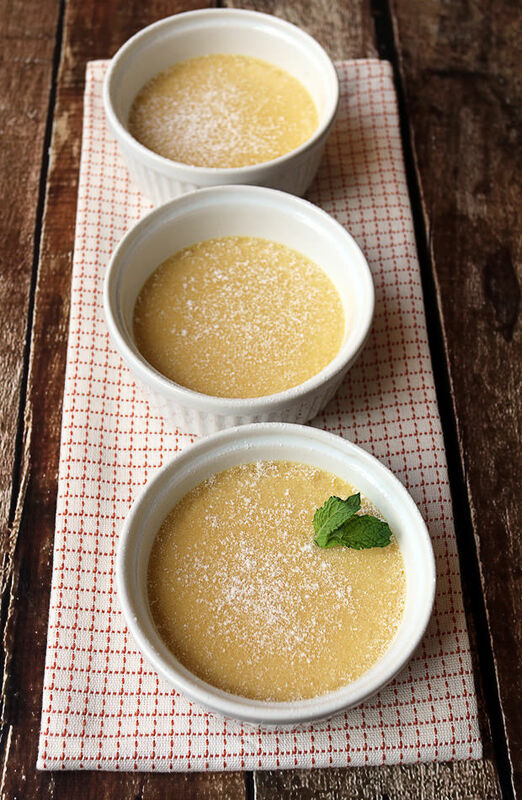 You can refrigerate them if you’d like them to be more of a light custard or pudding texture. You can eat them warm for a velvety soft and smooth texture. 14. Who are we kidding? Serve them up! This made 4 servings, but you are welcome to divide them into smaller servings. 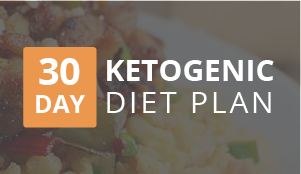 Each serving was 366.92 Calories, 37.17g Fats, 3.26g Net Carbs, and 5.23g Protein. Preheat oven to 300F. Separate 4 egg yolks from the whites and save whites for a different recipe. Powder erythritol in a spice grinder completely (about 20 seconds). 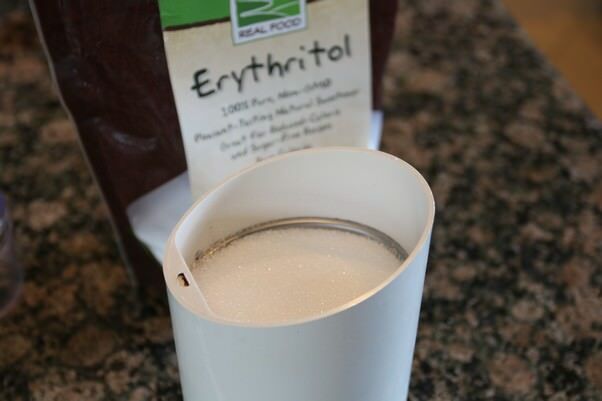 Mix together powdered erythritol and water in a small saucepan and bring to a boil. In another saucepan, add cream, stevia, salt, vanilla and maple extract. Bring to a rolling boil and then reduce heat to low and continue mixing. 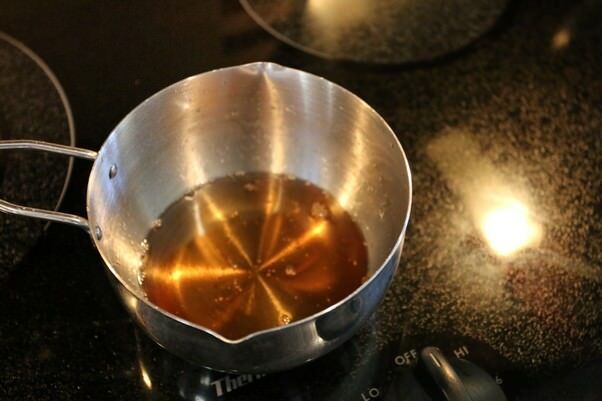 Once your small saucepan of water and erythritol is boiling, add maple syrup and continue mixing. 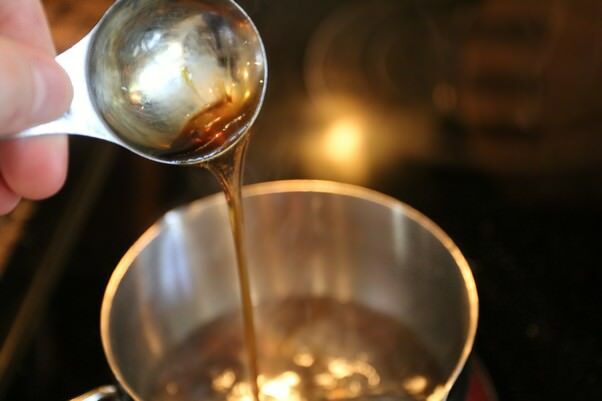 Let this boil for 2-3 minutes or until reduced some into a watery syrup. 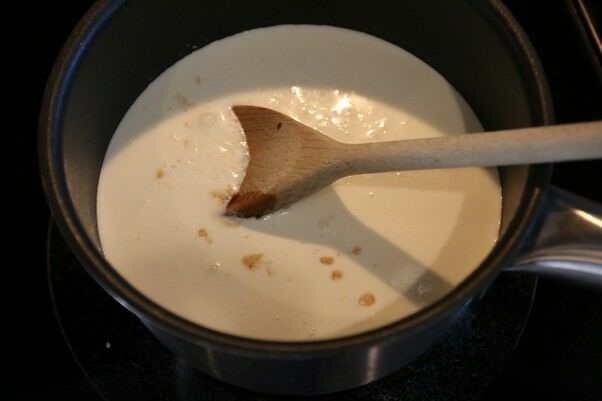 Add water and erythritol to cream mixture by slowly stirring it in. Then slowly add the hot mixture into the egg yolks to temper them. About 1/4 at a time. Mix this well to combine. 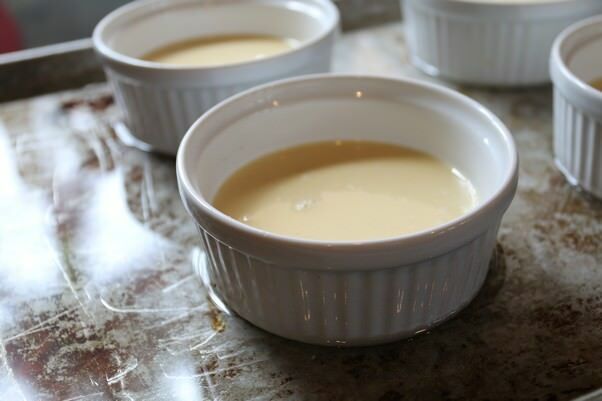 Once eggs are included in the mixture, measure out mixture into 4 or 6 ramekins (depending on size). Fill baking sheet 2/3 the way with water, put ramekins on baking sheet, and bake for 40 minutes and remove from the oven. Refrigerate or serve warm. 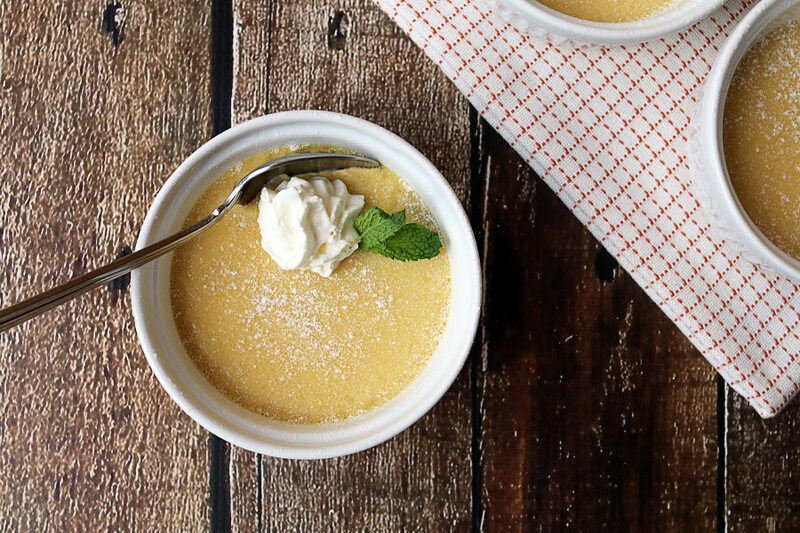 The colder they get, the more of a light custard it forms into.